Enjoy the fascinating fragrances of nature with our exclusive range of Honey Mint Incense Sticks. This twin series of Incense Sticks is highly appreciated from users belonging to both the national and international markets. 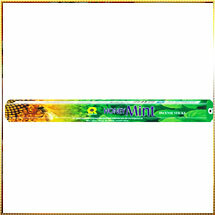 Our Honey Mint Incense Sticks is an unique creation of pure and fresh mint herb and honey. It releases less smoke and spread magnetic fragrance that enchants all. The luscious fragrance brings you more closer to God as you can concentrate more during prayers. It helps to make the environment clam and serene. Apart from this, we also put immense concern on air-tight packaging that helps to retain the aroma for longer time period.